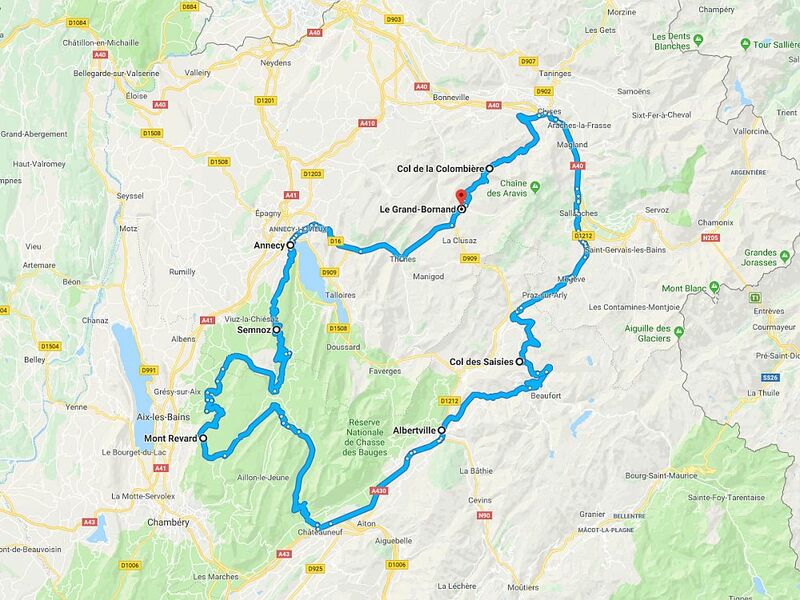 We had quite a big ride planned today with our proposed route taking us over 6 passes. 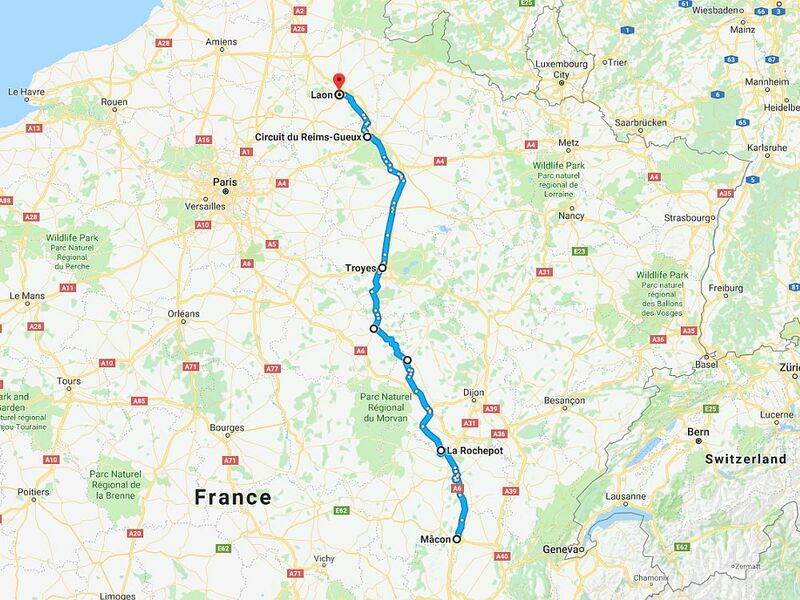 After our second pass of the day, the Pourtalet, we would be leaving France and spending pretty much the rest of the day in Spain. 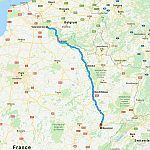 Once on the Spanish side we were going to head for Castejon de Sos where we had a couple of passes earmarked, and crossing back into France just before Saint-Beat, we had another couple of passes to ride that would take us into Saint-Lary, our final destination. 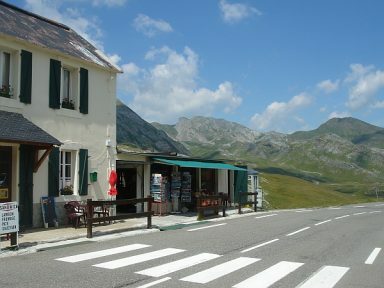 Leaving Urdos this morning we rode north up the N134 to Escot, and then east over the Col de Marie Blanque on the D924 to Bielle. The N134 is an excellent road but the pass over the D924 is nothing to write home about. 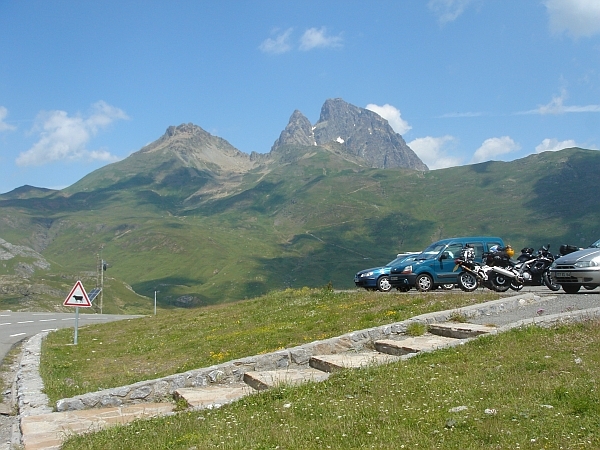 From Bielle we headed south on the D934 to Laruns which took us up to the Col du Pourtalet. Whether you are going south from Laruns on the French side, as we were, or heading north up from Biescas on the Spanish side, the Pourtalet is a wonderful pass to ride. It’s tight at the bottom if you’re coming from Laruns but as it climbs it opens out and you get some wonderful views. In a car you’d be stuck behind slower traffic until the pass opens out but you could enjoy the road further up. On a bike though traffic is rarely a problem for more than a minute. On the way up the Pourtalet the group split by the time Phil, Chris, Pete and Kyle reached the top there was no sign of the others. The views up top were good so rather than chasing after them it looked like a good place to take a break and stop for a coffee. Meanwhile Gaz, Taj, Cat and Mark had also stopped for a coffee, except they were a mile further down the road on the Spanish side of the Pourtalet. Coffee stops over we regrouped for the ride down the other side. From the Pourtalet we then rode down to Biescas and took the N260 through Broto to Boltana. 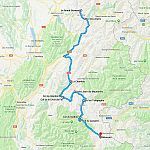 The first part from Biescas to Broto was okay but the road surface deteriorated significantly between Broto and Boltana. Not a road to travel on if you’re in a car as you could be stuck behind a coach or something similar for miles. After Boltana the road has been modernised and for the next 20 miles this became a really nice fast section of road until it reached the gorge near Campo. The scenery from here all the way to Castejon de Sos was quite spectacular. At Castejon the N260 continued over a couple of nice passes, the Coll de Fadas and the Coll de Espina, until it joined the N230 where we headed north to Vielha and eventually back into France. 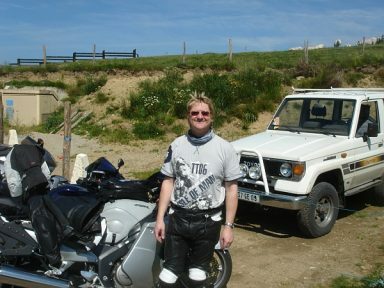 The N230 is a fast modern road but we did have to sit and suffer a long dusty tunnel before Vielha. 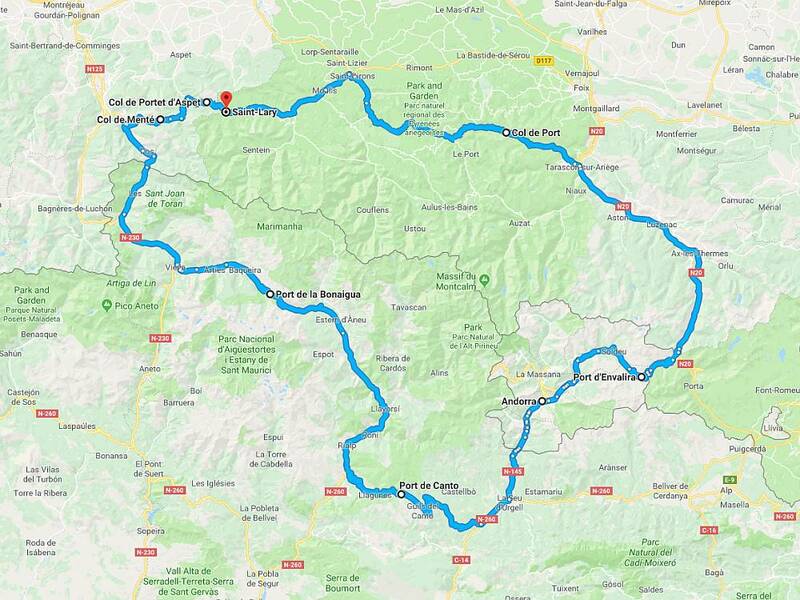 After Vielha it was fast until we reached Saint-Beat where we turned right over the Col de Mente – a typical hairpin pass – and then over the Col de Portet d’Aspet to Saint-Lary. 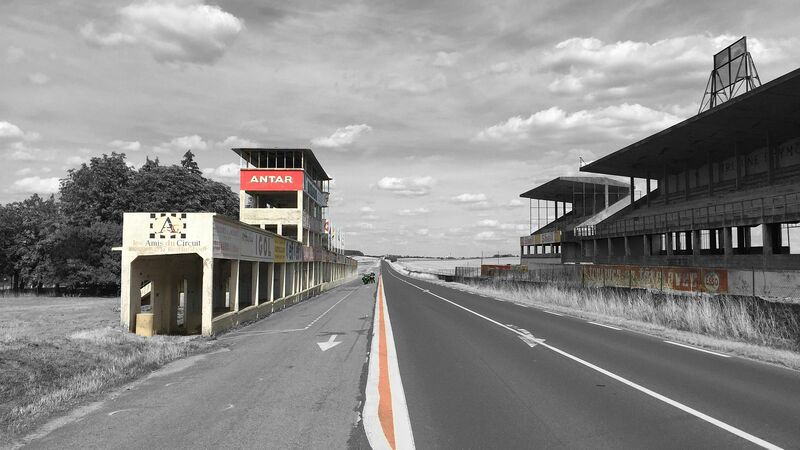 Both of these passes have memorials to Tour de France riders. 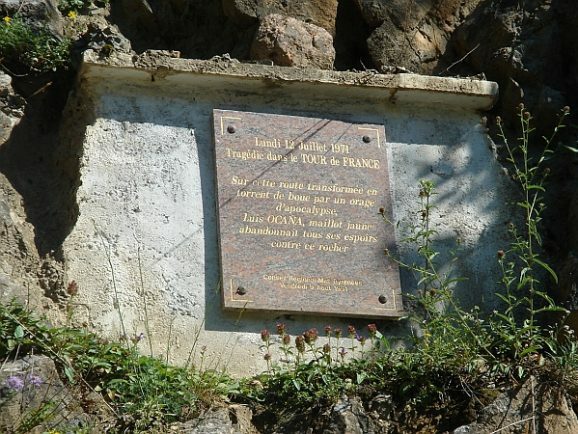 On the eastern side of the Mente there’s a plaque for the Spanish rider Luis Ocana, who crashed out on the 14th stage of the 1971 race while he was wearing the leaders yellow jersey. On the Portet d’Aspet we noticed another larger memorial with fresh flowers on it. 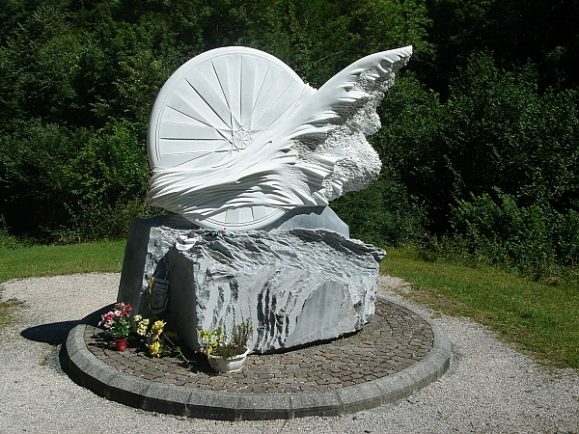 This is for Fabio Casartelli, an Olympic gold medal winning cyclist from Italy who tragically died descending the pass on the 15th stage of the 1995 race. At Saint-Lary we stayed at Auberge a l’Isard. This hotel is run by a very friendly family. It’s clean and comfortable with good food and it comes highly recommended. 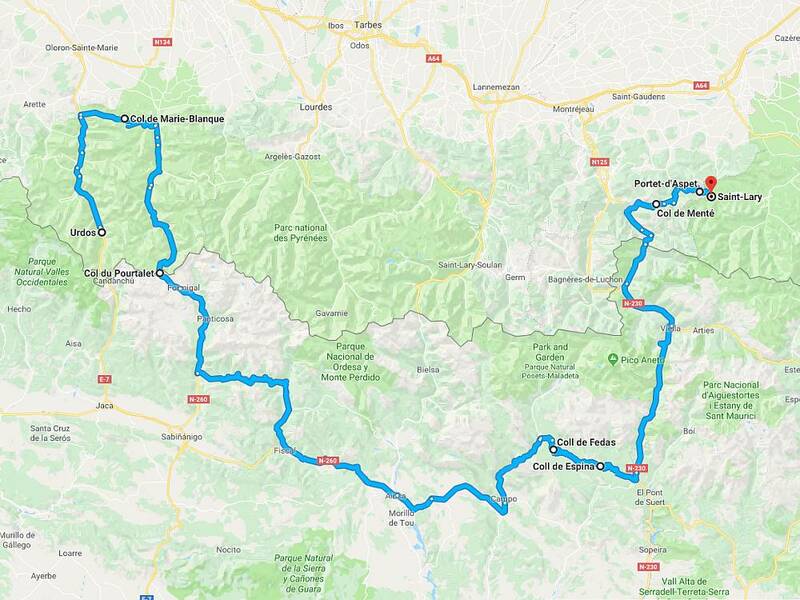 Today the plan was to ride a 250 mile loop that would take us from Saint-Lary, into Andorra, and back again. 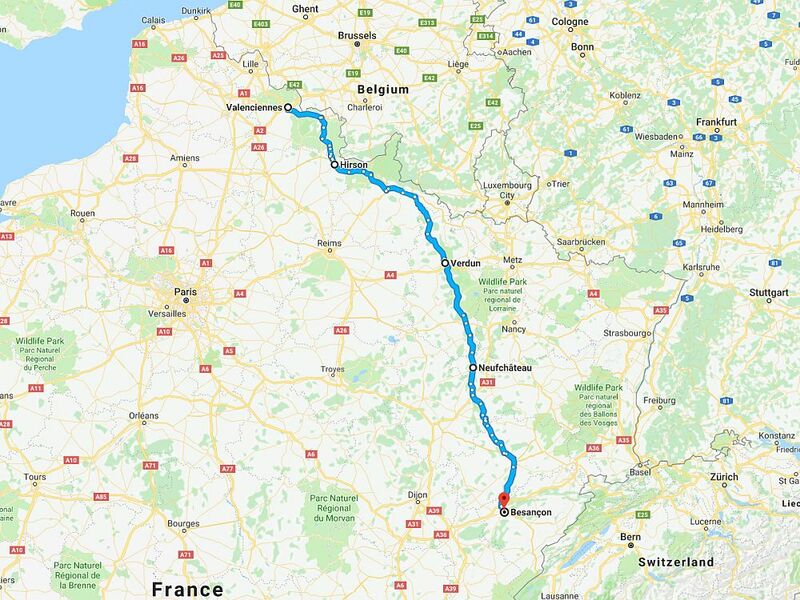 We would be entering on the French side, then exiting the other side in Spain, eventually picking up the same road that we’d ridden into Saint-Lary on yesterday. Unfortunately Pete couldn’t make it, he was in quite a bit of pain from an old shoulder injury and it had been playing up for the last couple of days, so he decided to give the ride today a miss. The vast quantity of wine consumed last night may also have contributed to his absence. For the rest of us, we fought off our hangovers with coffee and croissants. Saddling up we left Saint-Lary and headed east down the D618 to St. Girons through Massat and up to the Col de Port. 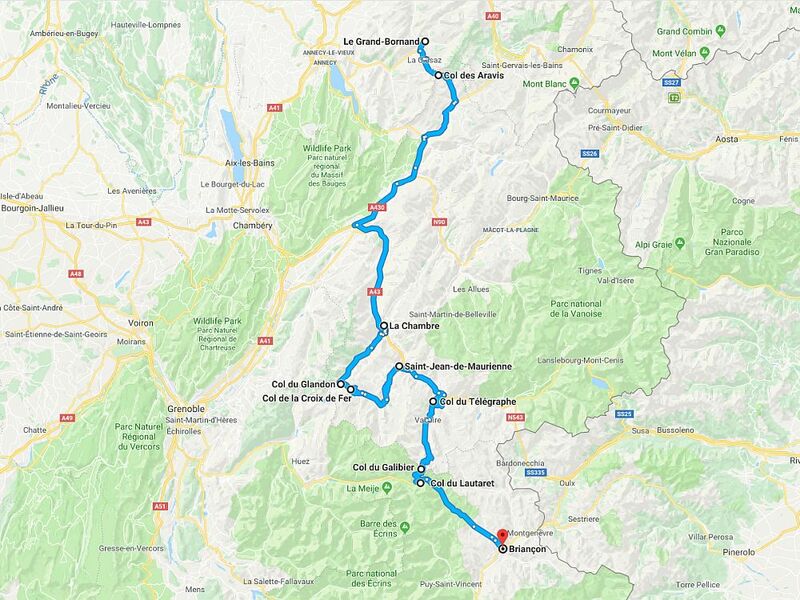 It’s only 40 miles or so from Saint-Lary to the top of the pass but heavy holiday traffic and a local cycle race turned a 75 minute ride into a couple of hours. The fact that there were 7 of us didn’t help much either. With all the overtakes in the heavy traffic it made life tricky for anyone at the back to keep up with whoever was leading at the front. Whoever happened to be tail-end Charlie had to work very hard to make all the overtakes just to keep in touch. 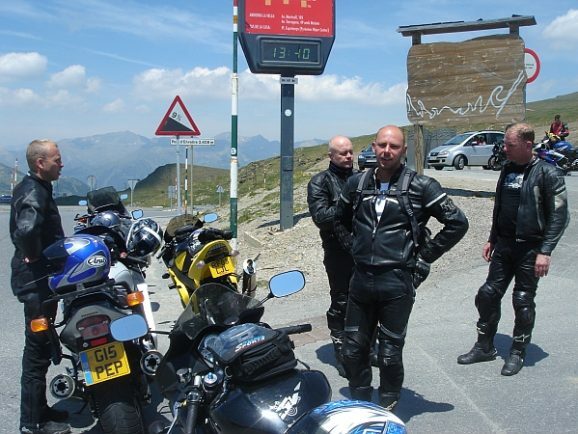 As a result there was a lot of jostling for position and needless to say by the time we got to the top of the pass we were ready for a coffee break. Fully refreshed we made our way down the other side to the N20 where we turned off left and headed south towards Tarascon-sur-Ariege. 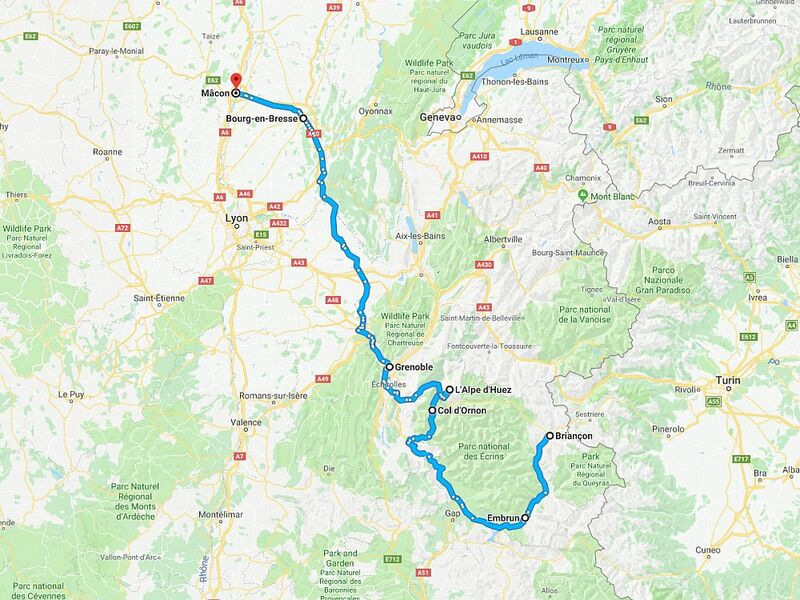 The N20 had heavy traffic until beyond Ax-les-Thermes. This is a superb biking road and since much of the traffic decided to use the tunnels into Andorra, we were able to crack on, up and over the Port d’Envalira – at 2,407m it’s the highest surfaced pass in the Pyrenees. In fact going over the d’Envalira was a good call because all the traffic we’d experienced before wasn’t a problem again until we got near the customs post and the busy ski resort of Pas de la Casa. 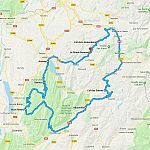 After we’d made our way through the ski resort we dropped down the CG-2 – Carretera General – towards Andorra la Vella where we looked for somewhere to stop for lunch. After a ridiculously large lunch we split into two groups. Chris, Gaz, Cat and Mark wanted to go shopping for cheap leathers and lids while Phil, Taj and Kyle wanted to push on. The main drag through Andorra la Vella wasn’t much fun, it was very busy and very hot, and it was a relief to get to the customs post and cross into Spain. 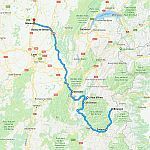 From here we took the N145 briefly to La Seu d’Urgell where we turned right onto the N260 towards Adrall all the way to Sort. 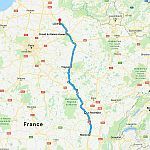 The N260 has to be one of the best roads in Europe, regardless of whether you’re in a car or riding a bike. It’s 29 miles of well surfaced road, with plenty of bends to play with, that takes you over mountains and across the Port de Canto. At Sort we picked up the C13/C28 to Sorpe and this is an equally good section of road. It was from here that we climbed up the Port de la Bonaigua, a pass that ultimately led us down into Vielha. Unfortunately there were extensive roadworks on the run up to the top and it was a bit hit and miss. In fact it was here that Chris had a front wheel slide on some loose gravel. Luckily it was at low speed resulting in only minor scuffs on the fairing and a broken bracket that held the rear brake lever. The run down from the ski resort on the other side wasn’t much better either as there were extensive roadworks here too. At Vielha though the road dramatically improved and from this point the route back to the hotel – for Phil, Taj and Kyle at least, was exactly the same as the night before. 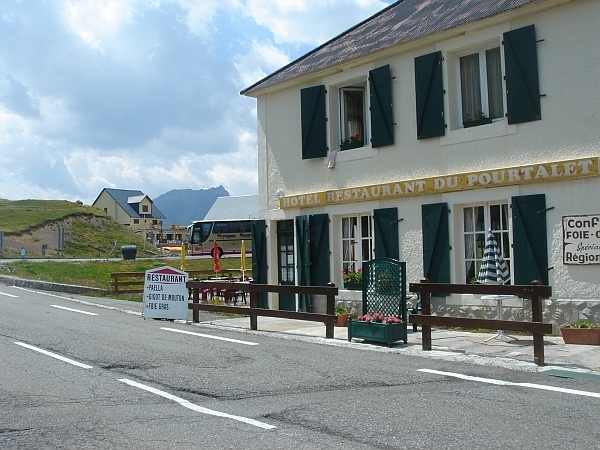 Vielha to Saint-Beat, turn right over the Col de Mente, and then over the Col de Portet d’Aspet into Saint-Lary. However the group behind had misprogrammed their sat navs for the shortest route possible and the result of this was they ended up following loose gravel forestry tracks for most of the way back. We like sat navs but they’re only as good as you programme them to be. 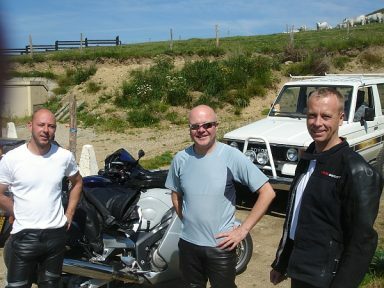 Cat, Pete and Kyle learnt that lesson on their run down to Millau. 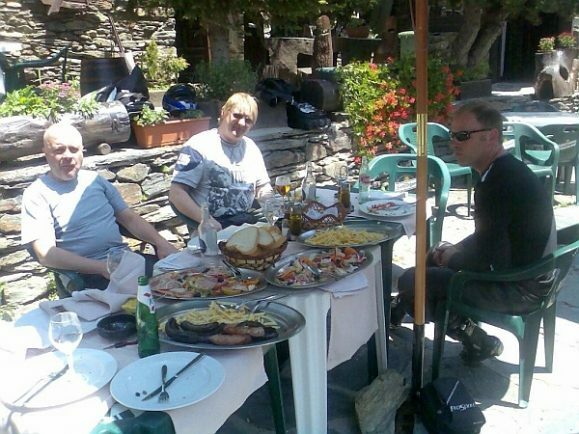 And Chris, Gaz, Cat and Mark found out the hard way too, eventually rocking up at the hotel an hour and a half after everyone else.